DeCarlo & Doll, Inc. was founded in 1980 and acquired by Luchs Consulting Engineers in 2006. Working as one integral team, Luchs and DeCarlo & Doll specialize in civil, highway, traffic, structural and utility design, as well as architecture, construction management and inspection services. Every infrastructure improvement project begins with understanding your unique needs. Our passion is in solving your challenges. We exist because of you, our client, and we are grateful for each one of you. Take a look through our site, call us, or stop by our office in Meriden for a visit ~ you are always welcome! And please Follow Us on Twitter, LinkedIn and Facebook to stay up to date on all the latest industry and company news. 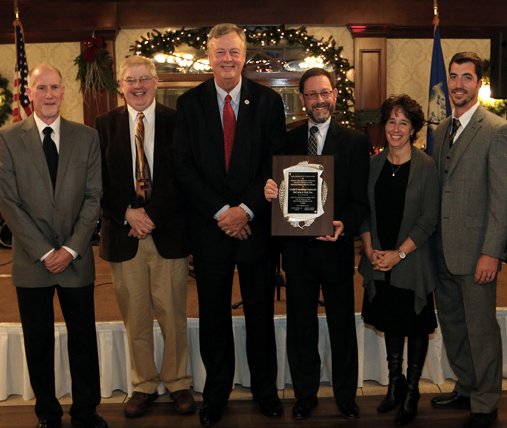 * Since 2014, CASHO’s Board of Directors has been presenting a Distinguished Service Award specifically to a consulting engineering firm that has demonstrated a willingness to “go above and beyond the call of duty” to provide technical advice and services to their member municipalities.